In the Summer of 2016, video content agency Forge Apollo reached out to us to help produce a 360 video series for their client, Dreams Resorts & Spas. 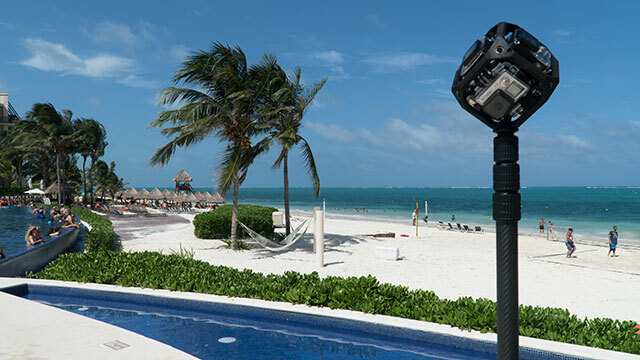 They had planned to shoot some content for a traditional video campaign in Cancun at Dreams Riviera, and wanted to bring along an experienced 360 production crew to capture the VR video content in tandem. The goal was to create a series of shorts for YouTube & Facebook to give potential guests the experience of what it's like to stay at the all-inclusive resort. For the hospitality industry, we can’t think of a better way to market than with 360 video, they’re made for each other. This project booked on fairly short notice, and without any room in the budget for scouting in pre-production, we had to plan accordingly and bring a wide variety of gear to be ready for any situation. We were ready with our cable cam, ROVR dolly platform, and ample options for camera setups. In total, we had around 10 scenes that we wanted to capture based around the family and their vacation experience. The beautiful open-air lobby was perfect for a cable cam shot, with large pillars lining the sides and a gorgeous fountain in the middle. With our adjustable speed remote cable cam, with just a few takes we were able to nail the timing and match the speed of our family as they moved through the lobby. We also ended up shooting more beach footage at another nearby Dreams Resort closer to Cancun proper. All in all, we captured a great deal of additional footage for coverage including high resolution 360 still panoramas of the resort, cable cam shots around the pool and many others. We always make it a habit to shoot as much as possible and give our clients plenty of options in post. The family and the folks from Forge Apollo were amazing to work with. Having an entire family that was able to be directed together made our job much easier than we expected. Although today we have many ways to live preview 360 while on set, this type of equipment was fairly limited in 2016. We made sure to provide quick dailies from rough stitches that could be reviewed each morning before shooting, and we were lucky enough to be working with a real family who could just be themselves on set. The end results were very natural. 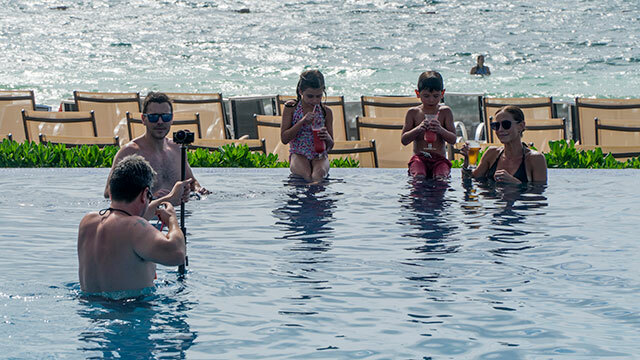 We delivered an 8 part 360 video series, each with it’s own unique experience from walking into the lovely presidential suite to enjoying pool time with the kids. We even crashed a wedding! You can view all of these 60 second mini vacations on Dreams Resorts’ playlist here. We also provided a Facebook cut of each experience, skipping the titles and jumping right into the action. Forge Apollo took the VR video series on the road for an activation in the middle of Winter in Philadelphia. They set up heat lamps, sand, adirondack chairs and beach cocktails and then transported viewers to the beautiful resort in Cancun in VR headsets. You can find more about this campaign on their website. "Your team was really professional, efficient, and handled everything really well on set."